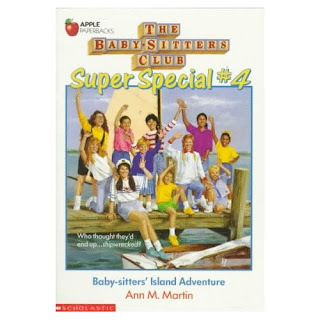 The Baby-Sitter's Club Super Special #4: Baby-sitters' Island AdventureThis was my absolute favourite of all the Super Specials...I really wanted to get stranded on a deserted island! Anyway, I digress. The quiz. I had to do this quiz. It was "Which Baby-Sitter's Club character are you?" (I was Kristy by the way, which was no big surprise!) and because I LOVED these books when I was a wee girl I just had to do it. I was the biggest fan of the Baby-Sitters Club. I would beg Mum to buy me new ones when they came out (especially the super special ones!) and I would scour the school and city library to find ones I hadn't read. I also read all the Little Sister books, starring Kristy's step-sister, Karen. I watched all of the tv show episodes and had all of them on tape. I also went to see the movie (and was disappointed it had different girls in it to the tv series) even though I was probably just a little too old for it by then. I even had the BSC Diary, with fun facts about all the girls (including their birthdays) and hints and tips for starting your own BSC. I convinced my sister and next-door neighbour, plus a few of our friends that we should start our own club. We failed miserably. Apparently it's NOT a good idea to have 10 and 11 year-old's babysitting other young children unsupervised! Who would have thought?!?! Not me, apparently! I did have a thought that maybe she had bought some over a little while ago, so I went and checked the back bedroom where I dumped a whole lot of my old kids books. There was no BSC books. Boo. Did you LOVE the BSC books when you were a kid? Did you read any of the Degrassi books? And if not, what books did you LOVE as a kid and why? I'd love to know so I can add them to my wish list...I think I'm gonna try re-reading some of these 'classics' again. I'll let you know how I go. I wasnt much of a reader as a kid , i was more into cartoons specially dragon ballz :P ... the first book i officially started with was "the alchemist"
Actually, this is the first time I come across a BSC book! Thanks for the review! And yes, my friends and I tried to start our own BSC too - I wonder how many were actually successful! Haha. I actually checked out ebay the other day, I'd love to start building my collection again too. Wonder if they'll ever make a revival like so many other 80's/90's toys (Cabbage Patch, Strawberry Shortcake, My Little Pony etc)? They'd totally have a market with all us late 20 and early 30 somethings wanting to relive our childhood!!! Friday Funny - Internet Addiction? Made From Scratch - Giveaway!!! More Time and Less Guilt Please! Stuff Made From Chocolate...Oh Yeah!